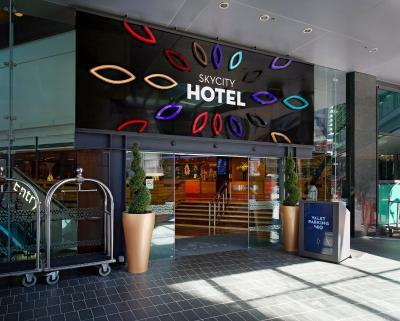 Lock in a great price for SKYCITY Hotel Auckland – rated 8.8 by recent guests! Comfortable bed and very clean rooms. Staff were very professional and helpful. The room was outstanding...huge, and I mean huge, living room with big screen tv, very comfy king size bed with tv in room as well, separate shower and bathtub. Central location, with variety of restaurants onsite. Parked the car for duration of stay ($35), walked or taxi to destination. Takes stress out of dealing with Auckland traffic! Kylie was extremely helpful during our check in process. We really appreciated all her help. Kylie's help made our stay extra pleasant. She is very customer oriented and thought of everything we might need. Loved that the rooms had recycle bins. Had a room service breakfast - delivered exactly on time, fresh and delicious. It is very convenient to get grocery and food. It's very centrally located, easy to go to the station and to the oceanside. 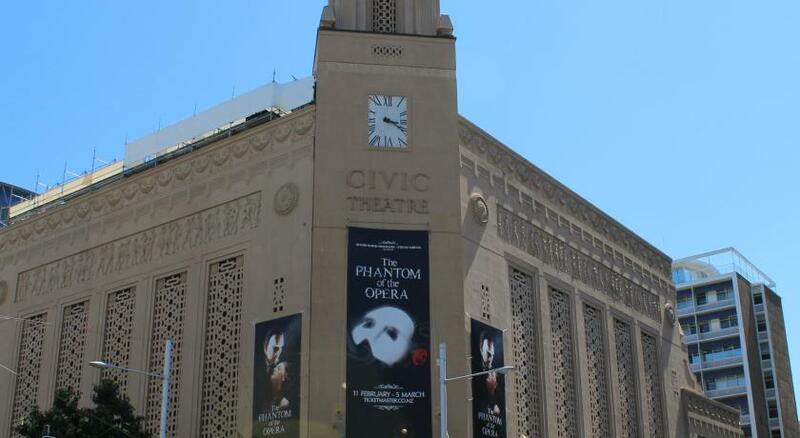 The hotel concierge was excellent in recommending the tours. 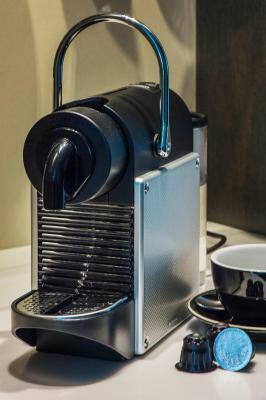 SKYCITY Hotel Auckland This rating is a reflection of how the property compares to the industry standard when it comes to price, facilities and services available. It's based on a self-evaluation by the property. Use this rating to help choose your stay! 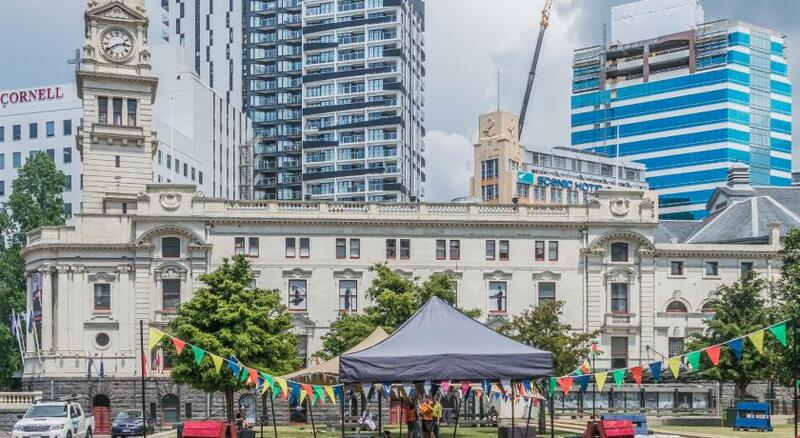 One of our top picks in Auckland.Located in the heart of Auckland CBD (Central Business District), next to the iconic Sky Tower and SKYCITY Casino, SKYCITY Hotel Auckland offers beautifully appointed rooms and suites with free WiFi, a 37-inch flat-screen TV and an iPod docking station. 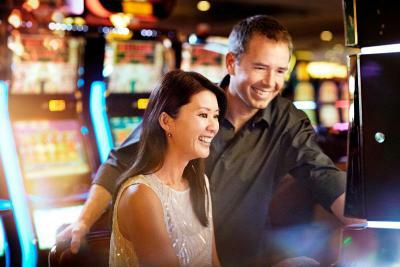 The 24-hour SKYCITY Casino features live entertainment, a theater and a choice of more than 20 restaurants, cafes and bars. The Sky Tower, rising 1,076 feet above sea-level, offers breathtaking 360 degree views from 3 observation levels. Union Pay is accepted here. Each air-conditioned room includes a private bathroom, mini-bar, satellite TV, including CCTV channels, and 24-hour room service. All rooms have a view of the courtyard or city skyline. Complimentary slippers and bathrobes are available upon request. Dental kits can be provided for an additional charge. 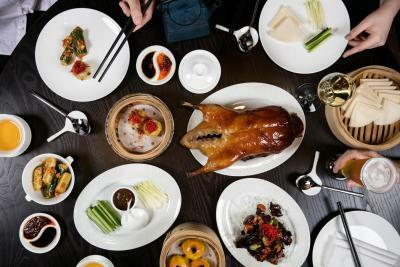 Daily breakfast is available at Fortuna Buffet Restaurant on Level 3, which offers modern New Zealand and international cuisine via a buffet breakfast menu. 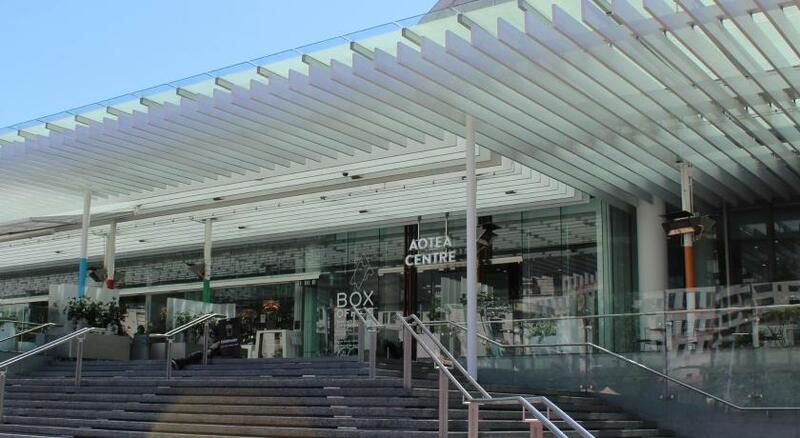 Britomart Bus and Train Station is just 10 minutes’ walk away from SKYCITY Hotel Auckland. 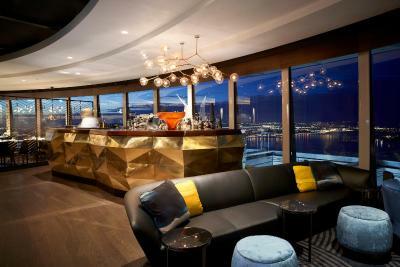 When would you like to stay at SKYCITY Hotel Auckland? This air-conditioned room features flat-screen satellite TV, a mini-bar and tea and coffee making facilities. The bathroom includes a bathtub, a hairdryer and free toiletries. Please note that for breakfast included rates, breakfast is only included for guests over the age of 14. 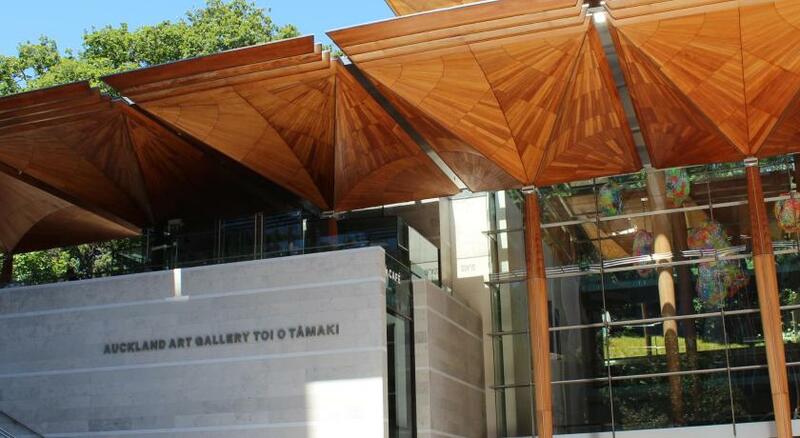 Children 4-9 years of age are charged NZD 10.90 per child, per night and children 10-14 years of age are charged NZD 13.90 per child, per night. Private parking is available on site (reservation is needed) and costs NZD 55 per day. This Suite features plenty of living and dining space with city views. It features flat-screen satellite TV, a mini-bar and tea and coffee making facilities. The bathroom includes a bathtub, a hairdryer and free toiletries. This room features overnight complimentary valet parking and late check-out until 13:00. This Suite features plenty of living and dining space with city views and an private bathroom. Please note that the price is based on 2 adults and 2 children. Maximum occupancy is 2 adults and 2 children or 2 adults (see Hotel Policies). This twin room features air conditioning, flat-screen TV with satellite channels, a mini-bar and coffee/tea maker. 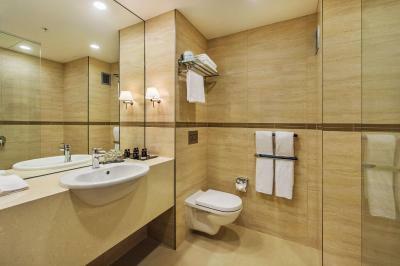 Private bathroom is equipped with a bath, hairdryer and free toiletries. This room features an entry ticket to Auckland's Sky Tower for 2 adults and 2 children. Escape to a hotel where exceptional experiences happen every day. A place where you can enjoy free Wi-Fi genuine Kiwi hospitality and modern, spacious accommodation. 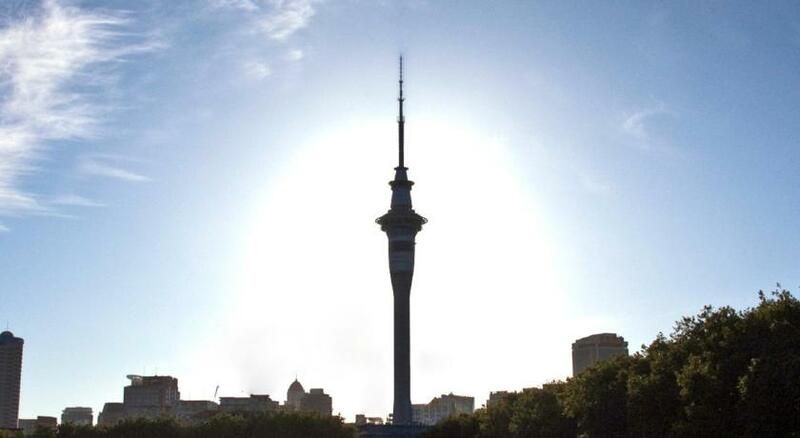 Explore the sights and sounds of vibrant Auckland, including the iconic Sky Tower. Pamper yourself at rejuvenating spa facilities. 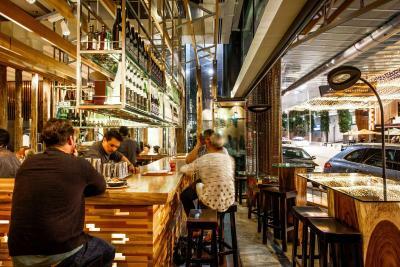 Experience magnificent dining with over 20 restaurants, cafes and bars close by, not to mention theatres and the exciting SKYCITY Casino. Before you return, relax and refresh with our world-class facilities and services, where your comfort is our priority. SKYCITY Hotel. Everything’s right here. 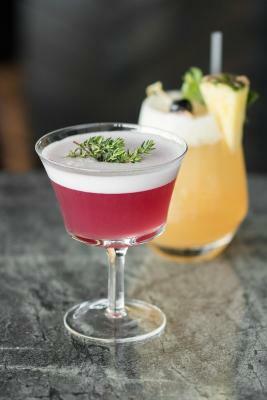 House Rules SKYCITY Hotel Auckland takes special requests – add in the next step! A NZD200 damage deposit is required on arrival (around USD134.38). This deposit will be fully refunded 7 days after check-out, as long as there isn't any damage to the property. SKYCITY Hotel Auckland accepts these cards and reserves the right to temporarily hold an amount prior to arrival. Please note that SKYCITY Hotel Auckland requires a NZD 200 credit card pre-authorization or cash deposit upon check in to cover any incidental charges. This deposit will be refunded upon check out, minus any applicable charges. You must show a valid photo ID and credit card upon check-in. Please note that the private parking is valet parking and is offered at an extra cost. Public parking is also available for an extra cost. It is self parking and only allows 1 entry and 1 exit. Please note that for breakfast included rates, breakfast is only included for guests 15 years and older. Children 4-9 years of age are charged NZD 10.90 per child, per night and children 10-14 years of age are charged NZD 13.90 per child, per night. A damage deposit of NZD 200 is required on arrival. That's about 134.38USD. This will be collected by credit card. You should be reimbursed within 7 days of check-out. Your deposit will be refunded in full by credit card, subject to an inspection of the property. Old bed TV to small. No bath.tiles on floor in bathroom appear to have a small leak running down edge of tile.car parking to dear. When I booked on booking.com it said with parking. It never said parking to be paid separately. They charged $35 extra for parking. RIP off! The room... the facilities...comfortable bed. As we were staying 4 nights, we brought our own breakfasts to have in our room. I was disappointed that there was a $5 charge per day just for the use of bowls and spoons. I feel, as a paying guest, that these should be provided on request, free of charge. 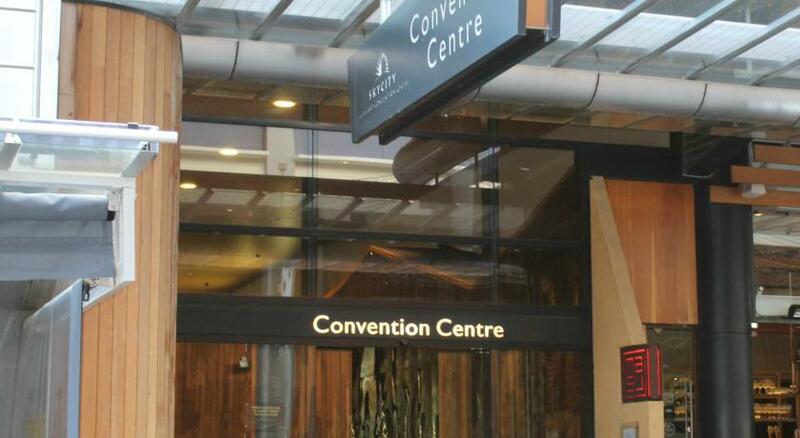 The location was perfect as our conference was at the SkyCity Convention Centre! Food choices are not great although I seem to be in the minority here. Location fantastic, rooms clean and tidy. Staff very friendly. Lifts!!! But appreciated their security. Getting to the Valet parking was ABYSMAL with Federal st blocked off and no directions for an alternative . The one guy who did try to help had no idea. So we circled the block and in the end entered through the the no entry to the lobby entrance which it turned out was the only way to valet park. No one seemed to think this was an issue at reception and didn't appear concerned that we had an issue. On leaving had to remind reception and valet staff that we were waiting for our car and did in fact wait for nearly half an hour. As always great staff. Very clean and in top condition.Very central to everything . The $200 booking fee think that’s a bit steep. Checked in room to find towels used and cups used. Informed front desk and required several calls to get resolved. Multiple lifts required to navigate from car park to hotel and room. Car park not clearly marked to where hotels allocation was. I like to read but my daughter dose not so a central light system was not ideal for our situation. I wish they had a “frequent customer” reward programme? Service exceptional, location perfect for our needs. Facilities (casino, restaurants etc) ahmazing. Be sure to treat yourself to a meal at Spicy Alley the food is phenomenal.